The important news first. My dad is continuing his remarkable recovery from his stroke earlier this month. He's going to PT 3 times each week and it sounds like they're really putting him through his paces. His speech is also improving. We spoke on the phone earlier this week for quite a while and I understood everything that he said. Two weeks ago I was scared that might not be possible. Last weekend's trip to Pittsburgh was interesting, but I don't think I need to go back. I was there briefly about 20 years ago. It's clear that the city has invested considerable effort in trying to move beyond they're history and reputation as a steel mill town. The mills are mostly gone, replaced by deluxe pedestrian shopping/entertainment malls. It seems like these are in turn sucking the life out of neighborhood retail just has they've done for the last 40 years all over the country. It seems like there might have been a lesson to learn there, but I'm not going to mount the urban planning soapbox today. So, we covered a good deal of ground, saw lots of neighborhoods (good and bad), and did a lot of sweating in the 95+ degree heat. The Nancy Crow exhibit at CMU was great. Although the gallery was a bit dim in places, the work still showed very well. We also spent Saturday morning at the Warhol museum--quite nice. 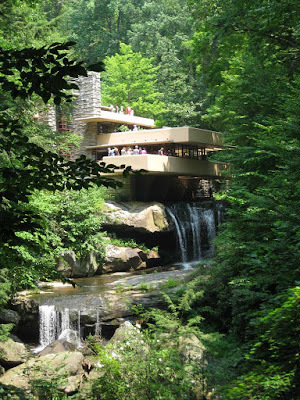 We left early on Sunday morning so that we could stop at Fallingwater and Kentuck Knob. Both were wonderful. Of course Fallingwater is such an icon. The tour was very well done, but it's hard to get a sense of the place when you're just zipping through it. This is one of those classic views of the house. In many ways it give you better sense of the place than does the tour, with the hustle and bustle of all the people. Dan and I were both surprised by Kentuck Knob. It's one of Wright's "unonian" houses, but on the high end of the scale (compared to the Pope-Leighey house for example). The house is lovely and very livable. The grounds are also a wonderful natural landscape and include a meadow full of tremendous modern sculpture. 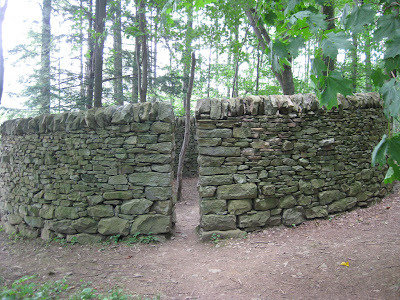 I was thrilled to learn from the tour guide that the collection includes not one but two Andy Goldsworthy's. I love the earthy, organic feel of these sculptures. 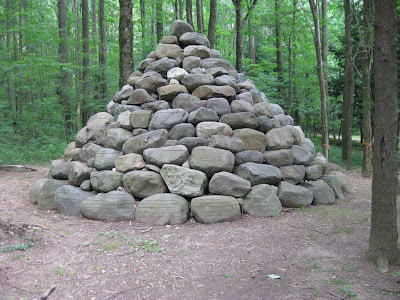 There's no reason that I should come upon a stone circle or a cairn in the middle of the woods, but what a delight when I do!